It is ironic that it is this post about following is the one that stalled me out. But it did. Thank you to everyone who wrote, called and hunted me down at a Grind In to tell me to keep writing. You guys are the ones I need in my life. In Mark 1:16-20, Jesus calls Peter, Andrew, James and John to be His disciples. Through them, there is an implicit call to us as well. We are called to follow. All four were fishermen. All four were parts of successful, family businesses. All four heard the voice of Jesus calling them to follow and all four followed. The call of Jesus for the disciples to be “Fishers of men,” has become a rallying cry for evangelism in the modern world. I think it is more than that. I think it is the further incarnation of Jesus. God who created humankind became a human. He became incarnate. He took on human flesh. General, human flesh. General human–a man–a person–a creation. 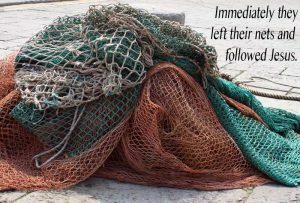 But when Jesus called the disciples and asked them to be “Fishers of men,” He was speaking the language they could hear. Because they heard, they followed. I listen to sermons, I listen to churches, I listen to Christians speak, and it is as if they are from another planet. They talk about things like sin, salvation, atonement, predestination, incarnation. They speak a language that is largely gibberish to anyone outside of their little church circle. In fact, one little circle of Christians can talk about salvation using a particular set of vocabulary words used by another little circle of Christians and they mean very different things. No one bothers to check to see if anyone is hearing what they are saying. When God wanted to call disciples (hear the vocab? ), He became one of them and spoke the language they understood. Not just God to human, but God to human to a specific person whose life was about fishing. He asked him to go fishing with Him, but they were going to fish for bigger fish. And four guys understood they were being called for something greater. Sometimes I think we forget all these god-words are supposed to mean something to the people who hear. Sometimes we forget these god-words mean something to us. Sometimes, they are just words spoken in some kind of foreign language. That is part of my problem. I need to hear God speak in words I understand again. I need Him to call me from THIS life into something greater. I need him to speak to THIS person and call me onward. Amen. Let God work. Listen to God speak. I think we need to listen. Focus on God and not the world as much. Listen, listen, listen. God is always molding. most of what he says goes past us because we are thinking and doing other things. Focus. He speaks to us but we are somewhere else. He is always speaking, calling to us. We are missing the boat, most of the time, so to speak. Perhaps something interesting in the calling of the disciples is that it was in the plural. The passage tells us there is an immediate response from Simon and Andrew and then immediately they went a bit further before the second pair, James and John was called. As Jesus begins to immerse these men in life with him they had somebody else to absorb it with;somebody else to share the ideas, the fears, the doubts. Having a buddy in faith certainly makes a difference. Somebody who can remind us what we have seen God do and that He has, indeed, called us. Called us and called us to do the stuff He does. Kinda scary. This is the Derrick I remember most — not only following, but teaching. These men, these disciples, did not follow with just words, they followed with action! And, as you say, they listened. How many times do we listen to “understand” instead of to just prepare an impressive verbal response? I also like Wendy’s term “absorb.” This is a word I think of mostly when I think of Christ on the cross — “absorbing” our sins. Dan, I have been thinking about your word picture … of “sins being absorbed on the cross” as opposed to the typical phrase “sins washed away”. I like the absorbed… for me the image allows for the sin to be that… and recognize it has effect (having to be absorbed) as opposed to the “wash the sins away” which is often said as though it is a slight of hand. – – – and then there was the lawyer who asked Jesus, “who is my neighbor”? I am reading, and waiting to read. I’m listening to Michael Card and I can’t stop. e-mail me your cell number sometime.